Sagar Vani is meant to serve 300 Million of our citizens living in coastal areas. Public, Govt. and NGO’s will receive feeds and alerts through advanced cloud systems in over 27 delivery mediums. 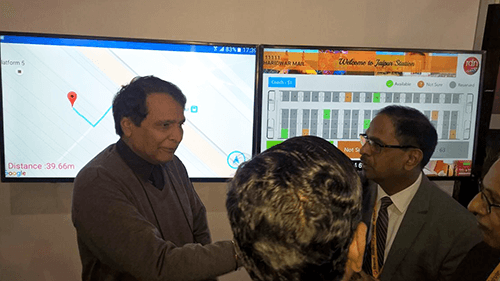 World class information communication technologies in Artificial Intelligence, Big Data, Speech Synthesis, Analytics were used in bringing this platform to life that will serve to alert coastal population of India. We are happy to share with everyone that Gaian’s Information Dissemination System (IDS) for INCOIS, Ministry of Earth Sciences, Govt. 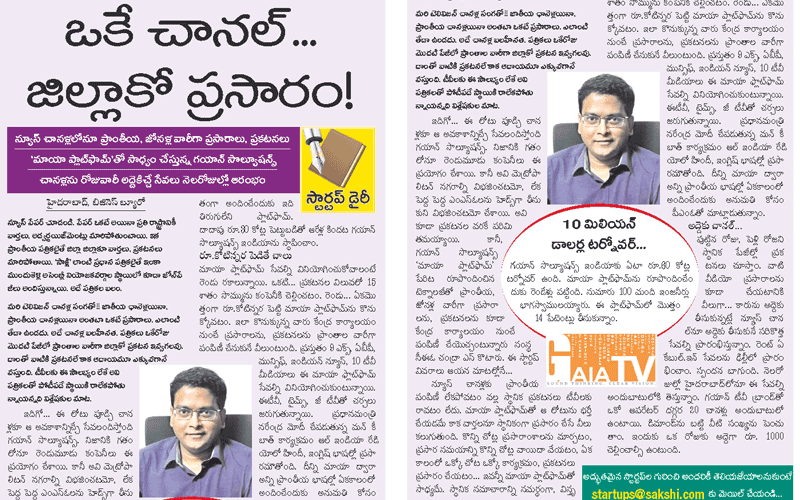 of India featured in a leading telugu daily Eenadu. 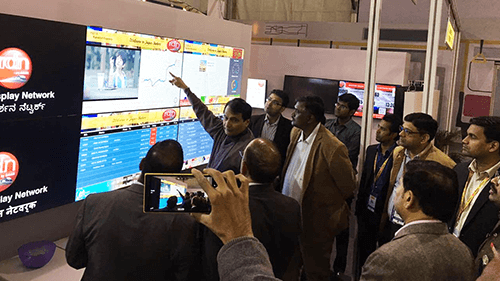 We are really happy to share with you that the same products you use to enhance your customer/user experience are now being used to build the largest DOOH network in the world, India’s Railway Display Network. It is a pan India network that enhances railway passenger experience and exponentially improves the advt. monetization potential. We would like to thank all of you for your support and trust all these years. 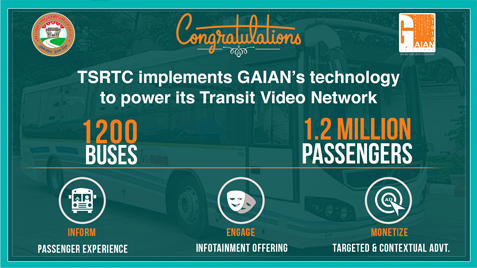 TSRTC, Telangana State Road Transport Corporation, implements Gaian's technology to create and manage their Bus Video Network in the city of Hyderabad. A display network of 1200 buses to provide travel information, infotainment, and targeted & contextual advertisements to the bus passengers. This is set to generate substantial revenues for TSRTC while enhancing travel experience of 1.2 million passengers daily. We believe this and other wins we've had in the recent past are just the beginning of a spree of display video networks that Gaian will deploy for its customers. Indian National Centre for Ocean Information Services (INCOIS)–Ministry of Earth Sciences, Govt. 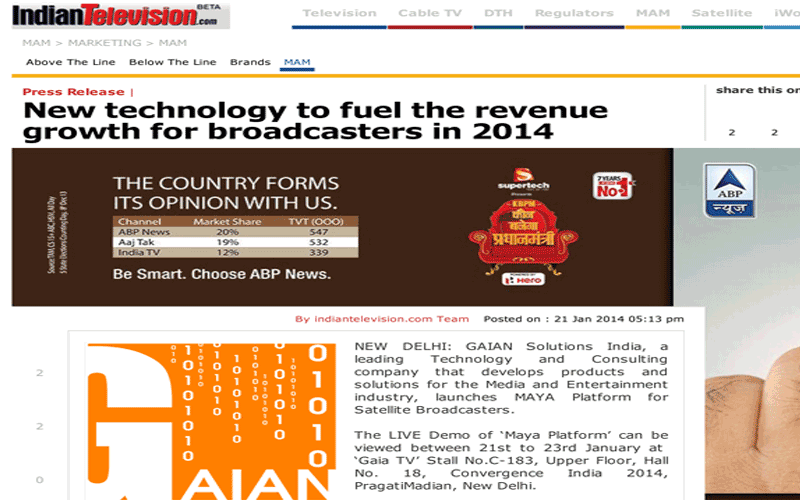 of India–has awarded Gaian Solutions India Pvt. 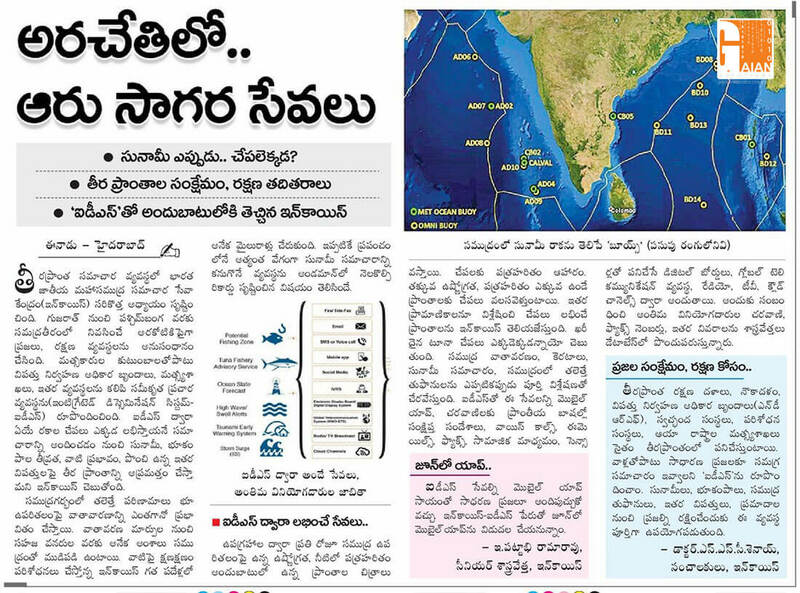 Ltd the tender for Integrated Dissemination System (IDS) for ocean information and advisory services. Gaian’s IDS–with state-of-the-art customizations for INCOIS– will disperse ocean information, coastal weather reports, natural calamities and advisory services publicly to the entire country and privately within the INCOIS community in a structured manner; thereby safeguarding the interests of the public and private entities in the country. 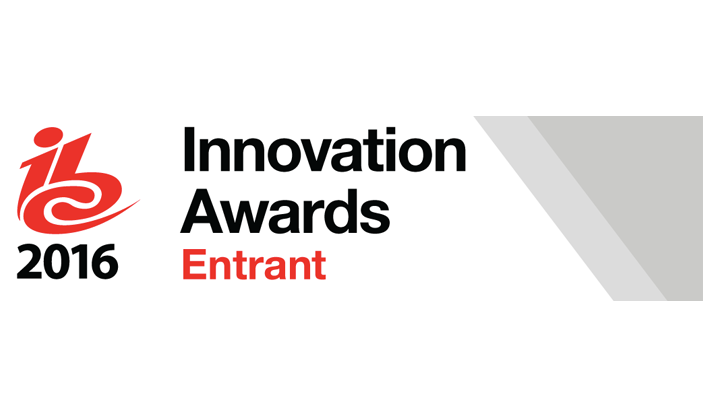 Gaian Solutions is an entrant in IBC Innovation Awards in the Content Delivery space. Industry recognised and renowned for their prestige, the IBC Innovation Awards have grown to become the most valued honour for technological developments and collaboration. Every year the popularity and demand for the IBC Innovation Awards increases, and the 2016 awards are set to be the best yet with fierce competition and exciting entries across all three categories: Content Creation, Content Management and Content Delivery! 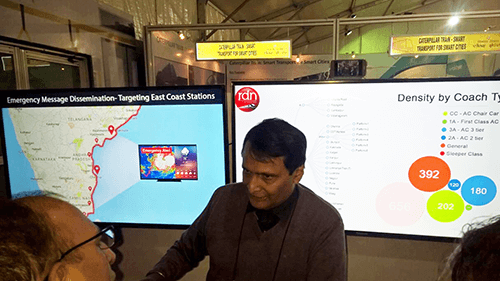 Indian Railways announced the Railway Display Network (RDN) initiative in railway stations across the country which envisages more than 100000 connected smart screens across 2175 railway stations making it the largest DOOH network in the world. The consortium consisting of Gaian Solutions India Pvt. 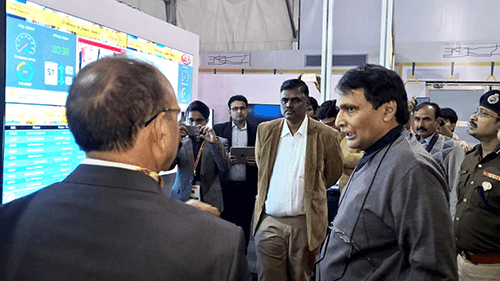 Ltd., iTV Network India Ltd, and Cloudatix Network Private Ltd won the tender to partner with Ministry of Railways to setup and maintain RDN with its Content Display platform solution despite the tough competition. There is plenty of wait-time for patients and visitors at hospitals and healthcare centers. Hospitals have learnt that there will always be wait time given the traffic they receive, but instead of viewing it as a challenge, they are pursuing it as a valuable opportunity to reach their patients/audience with important educational announcements, healthcare programs, and advertisements. In the food retail business customer service is key. Good customer service involves leveraging on up sells, providing customer loyalty programs, and creating brand awareness. These opportunities can be missed if the business doesn’t promote products and services appropriately at the point of sale. This is where digital signage and retail TV solutions come into picture. 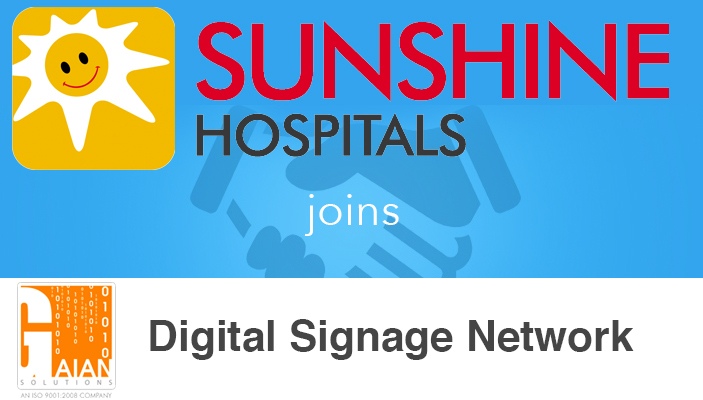 Doctors' offices, healthcare center, and nursing homes are discovering that digital signage has the potential to revolutionize the way they communicate with their patients and visitors. 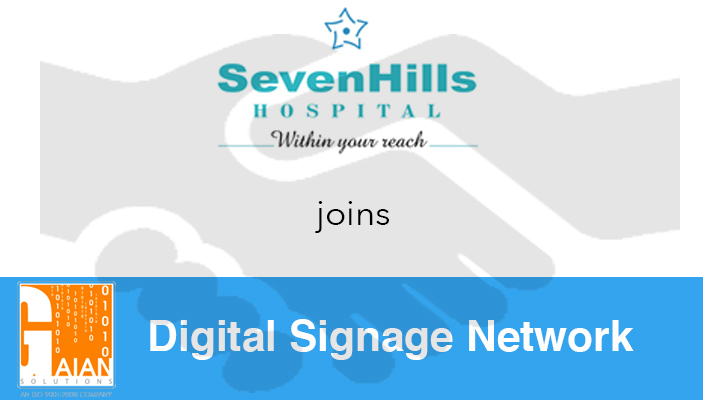 The advantages are clear: digital signage is visually dynamic, engaging and flexible. 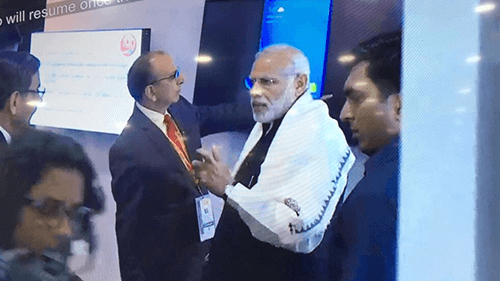 న్యూస్ చానళ్లోనూ,ప్రాంతీయ,జోనళ్లవారీగా ప్రసారాలు, ప్రకటనలు 'మాయా ప్లాట్ ఫామ్'తో సాధ్యం చేస్తున్న గయాన్ సొల్యూషన్స్ చానళ్లను రొజూవారి అద్దెకిచ్చె సేవలను నెలరోజుల్లొ ఆరంభం. 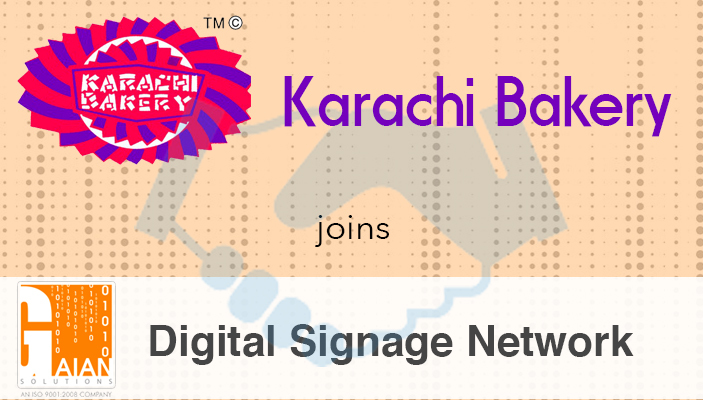 As brands and advertisers realize the inherent shortcomings of traditional media, they are investing in newer marketing vehicles such as digital signage due to its ability to reach huge audiences and play engaging and targeted messages at the point of sale. 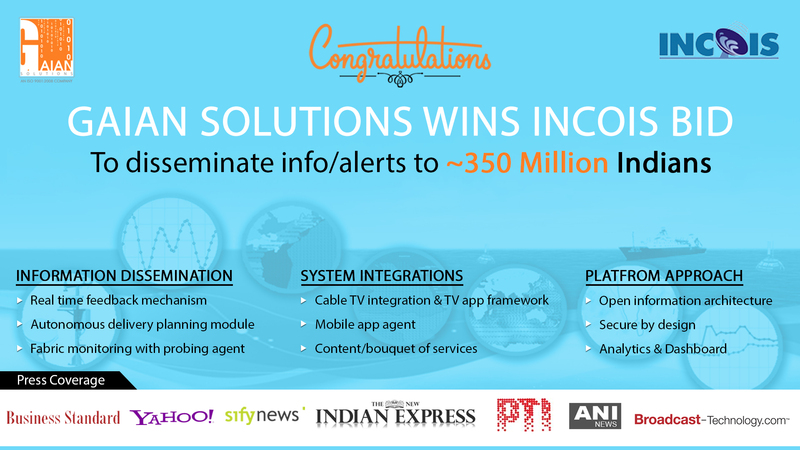 NEW DELHI: Gaian Solutions India, a leading Technology and Consulting company that develops products and solutions for the Media and Entertainment industry, launches Platform for Satellite Broadcasters. The LIVE Demo of ‘ Platform’ can be viewed between 21st to 23rd January at ‘GAIATV’ Stall No.C-183, Upper Floor, Hall No. 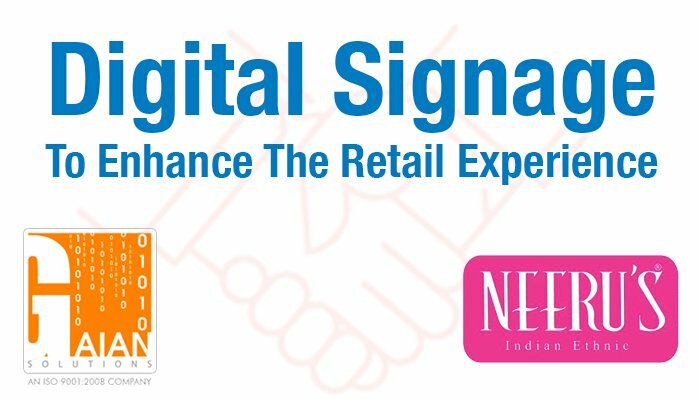 18, Convergence India 2014, PragatiMadian, New Delhi. 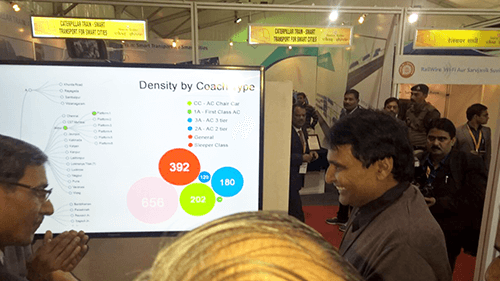 Gaian Solutions at Convergence India international exhibition and conference held at Pragati Maidan, New Delhi. GAIATV is a content delivery platform entirely on the cloud. The unique feature of GAIATV is that it enables targeted advertising with consumer analytics and predictive profiling. The platform is operational on almost all consumer devices --be it laptops, tablets, smart phones, DVD players, game consoles or set top boxes. With GAIATV, customers get the best of both the worlds while leveraging all the economic and disruptive benefits of the cloud on one hand they can still offer a complete delivery platform.